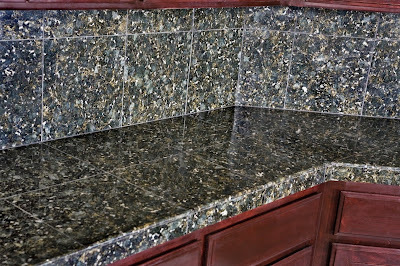 Kitchen and Residential Design: Reader question: Should I get granite tile counters? Reader question: Should I get granite tile counters? Help! Is granite tile really less expensive than slab granite? I really want to redo my countertops with granite but cannot afford it. Is this a good option? To answer your first question; yes, granite tile costs less than slab granite. So far as the second question goes, the answer is as resounding a no as I can muster. Granite tile looks like crap on a counter and there's nothing you can do to make it look good. Worse, there's nothing you can do to perform well. 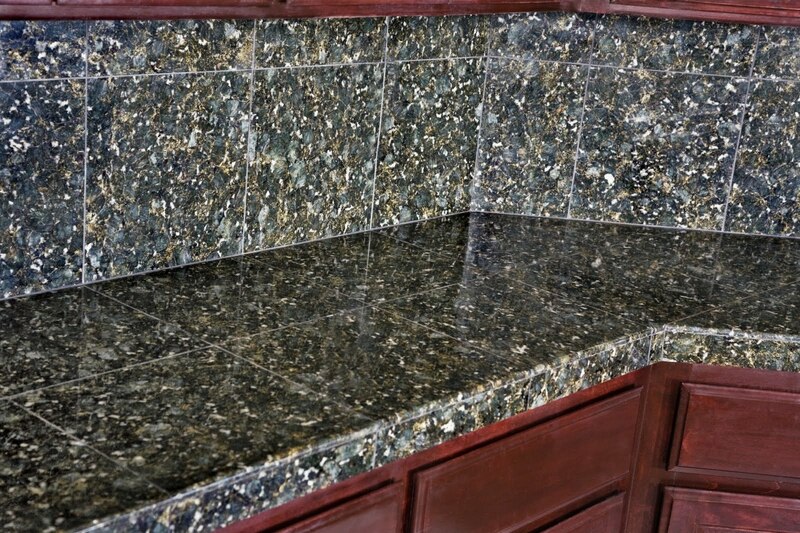 Granite tile counters may look like a good option because they're relatively cheap. But believe me, it's a short term gain. I don't like to think in terms of resale value and I realize I'm alone in that. So with that said, think about this. Installing them will add nothing to the value of your home and may even detract from it. Functionally, they stink too. It is impossible to fully seal grout. It will always discolor and it will always harbor the residue of whatever's been prepared on it. Remember too that where there's food residue, there's also bacteria and mold. Ugh. Bacteria and molds are fascinating when they're in a petri dish or on a microscope slide, but I don't want them colonizing my kitchen counters. Seriously, when an alternative is drastically cheaper than what you really want, think twice before you act. Just as with everything else in life and not just kitchen counters, unusually low prices are a warning sign. Or they should be at any rate. If somebody offered you a new 700-series BMW for $10,000 what would you think? Not everybody wants to spend a couple thousand dollars on new counters and that's OK. There is nothing wrong with having other priorities for your money. So rather than wasting it on granite tile counters, why not look to laminates? Laminates are the whipping boy of the counter world and it's unfair. They get maligned by purveyors of such things as solid surface, but I'd put laminate counters in my house before I thought of anything else were I in your position. Laminates are workhorses and they're available in more colors and patterns than you can imagine. When you approach something like laminate, let it look like laminate and don't go for patterns that imitate other materials. Just as granite tile looks cheesy when it's made into a counter, so too do laminates that pretend to be granite. Here are a handful of laminate patterns from Formica, probably the best-known laminate manufacturer out there. Chin up man, and remember it's not that you can't afford granite. Rather, it's that you'd rather spend your money another way. Semantics? Sure it is, but you create your life every time you open your mouth. Tiles countertops is one of my decorating pet peeves. They just aren't a good idea, no matter how you look at them. As you said, the grout presents all kinds of problems. And they just kinda cheap. I was in a hurry when I grabbed those images from Formica's site. I suppose I should attribute them. But there are so many cool laminate patterns out there, I don't get why someone would even consider granite tile. It's never anything but a second best and it always looks cheesy. I agree entirely about granite tiles. The top and bottom Formica patterns are very cute and retro. I don't have a problem with the better-looking laminate stone imitators, though. I think they're fine for super-budget projects. You can find them in stock at home centers for unbelievably good prices. I'm with you Jamie and I never did understand why laminates have such a stigma attached to them. I've seen some fantastic looking laminates. It seems to me that companies like Formica have had to step it up these last few years, competing with the rise in popularity in solid surface counters... and the results have been terrific! I couldn't agree more Victoria and congrats on the newest addition to your family. And yard! I've lived in a rental with granite tile kitchen counter (briefly), I've lived in a rental with tile countertop. Really, I much prefer laminate. Better work surface, easier to clean. I lived for four years in a rental with that boomerang pattern laminate. Fun! And it was an Eichler, so it really worked. I'm not a designer, but I think if I were putting in a laminate counter, I'd do a solid color. I don't have a problem with it at all. It's funny how many people look at me like I've lost my mind when I bring it up. How did laminates get such a bad rap? I think DuPont's Corian marketing from the '80s inflicted some lasting wounds. Granite tile can look nice--and tile counters can be extremely functional in a kitchen! As far as grout goes, epoxy grouts are NOT permeable and almost never stain, as well has not harboring bacteria. Only very flat tiles should be considered for counters. Tiles should be 6" or smaller or 1' or larger, and the larger ones should be put on a diagonal. There MUST be an overhang to the counter or the result will look cheap. The grout shoud be chosen to blend--busy counters are off putting to modern tastes--and you need to be very careful with your backsplash material if you choose a tile counter. These guidelines are rarely followed, but when they are, the result can be very attractive and can achieve a different effect than a solid surface. Stone with a strong graining is a particularly bad choice for tile. Overall, if I were doing granite of any sort, I'd choose a slab. But tile countertops are dismissed out of hand out of unfamiliarity and ignorance. Thanks for your comment Astrophil. I got taken to task pretty thoroughly over this one. Among its many attributes, a tile counter is also a regional preference. They are rarely done here but in some parts of the country and world they are a standard issue. While I don't doubt that they can be fully functional, the baker in me prefers a perfectly smooth surface in a counter. You just happen to show the two Formica laminates I'm thinking about for my kitchen (the 1st and 3rd pictures). I'm putting my 1960 Eichler up for sale and need new counter tops. I have the original Eichler kitchen, and I'm kind of leaning toward the gray boomerang sample. I'm just wondering if that is two kitsch, or should I just go with a fairly neutral looking gray Formica since this will be for sale purposes? Hey Dana: I think the Boomerang pattern is a little too too, you know what I mean? If I were you I'd go with something a little more subdued. Thanks for your comment! I love this post! I very much agree with what you have said here. We just started carrying the boomerang in Skylark and charcoal, along with the two colors of Beluga. The day I can sell a countertop in any one of those will be my happiest day working there. Hey! Thanks for your comment. How long have you been plying your trade at a home center? Like a lot of people in the business, I got my start in one. Shhhhh. Don't tell anybody though! I appreciate you comment and believe me, I feel your pain. Help! We are buliding a "booth" type of seating area that is attached to an island. The island has a 5" wall between it and the booth area. We are installing a taller "pub" height counter alongside the narrow end of the counter height island and the one back side of the booth. My question is: Can I put a strip of granite across that 5" wall top that is about 7' long, and attach it to the big slab of granite that will all be pub height. It might seem confusing, but I just wonder if a 7' x 5" slab of granite might look funny atached to the large peice of granite. Make sense?? Tricia, I cannot follow the question you're asking. If you'd like, you can e-mail me directly. I don't charge anything to answer basic questions. Thanks!